CHARLOTTESVILLE, Va. – A judge in Virginia heard arguments but didn’t issue a final ruling Friday on whether a lawsuit over Charlottesville’s decision to remove the Confederate monument that helped spark a violent white nationalist rally should go to trial. After an hours-long hearing on a motion by city attorneys to dismiss the lawsuit, the judge sided with Charlottesville on some points, tossing them from further consideration. But he said he needed more time to study the “main issue,” the question of whether a state law on memorials for war veterans amended in the 1990s applies retroactively, protecting the statue of Gen. Robert E. Lee. White nationalists descended on Charlottesville last month, in part to protest the city’s plan to take the statue out of a downtown park and sell it. Fights broke out before the rally got started, with attendees and counterprotesters brawling in the streets. After authorities forced the crowd to disperse, a car rammed into a group of people protesting the white nationalists, killing one woman and injuring many more. Since then, Charlottesville has shrouded the monument, and one of Confederate Gen. Thomas “Stonewall” Jackson, with a black tarp as a symbol of mourning for 32-year-old Heather Heyer. On Friday, the judge spent hours hearing from attorneys on both sides and asking them questions. Deputy city attorney Lisa Robertson cited previous case law and an opinion from Virginia Attorney General Mark Herring in arguing that the war memorials law does not apply to anything erected before 1997, when the statute was last amended. “It must be applied prospectively only,” she said. But attorneys for the plaintiffs, who include area residents and the Virginia division of the Sons of Confederate Veterans, said “plain common sense” shows it applies to the Lee statue. The General Assembly would not have suddenly “discarded” protections for existing monuments, attorney Ralph Main said. “They didn’t pass this thinking, OK, next year we’re going to build some monument to the Revolutionary War,” he said. Attorneys also argued over whether the plaintiffs have the legal standing to bring the lawsuit. In May, Moore agreed to a six-month injunction prohibiting the removal of the Lee statue while the lawsuit plays out. The City Council initially planned to leave the Jackson statue in place, but since the Aug. 12 violence, it has taken administrative first steps toward having that monument removed as well. The plaintiffs’ attorneys have asked that the injunction be expanded to protect the Jackson statue and to prohibit the city’s draping of the monuments. The judge said he would consider that later. Before the hearing began, Moore took the unusual step of addressing the dozens of members of the public in the courtroom, asking for order during the hearing on what he acknowledged is a contentious issue. He also said his office and the clerk’s office had received thousands of letters trying to sway his opinion. He said the letter-writing campaign had become a burden to the clerks and called it improper and unproductive. “Judges do not wait to see what public opinion says,” Moore said. 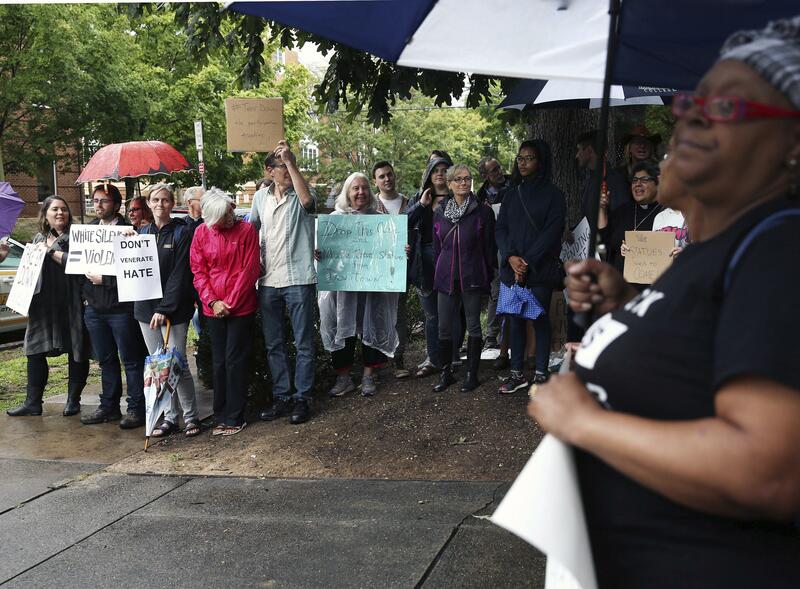 Before the hearing began, a group of several dozen people who opposed the statues gathered outside in the rain, singing and holding signs as they huddled under umbrellas. “Take them down,” they chanted. The violence in Charlottesville has fueled a re-evaluation of Confederate statues, symbols and namesakes in cities across the nation, accelerating their removal in much the same way that a 2015 mass shooting by a white supremacist in South Carolina renewed pressure to take down the Confederate flag from public property. Published: Sept. 1, 2017, 6:12 p.m.